The Executive Board of ILGA invites bids from consultants to develop and produce ILGA’s next Strategic Plan (2019-2022). For the period 2014-2018 ILGA has operated according to its strategic plan, which was produced by the ILGA Board in consultation with members and approved by ILGA's membership at the XXVII World Conference in Mexico City in November 2014. The Strategic Plan, which has guided the production of annual operational plans, will come to an end in December 2018. ILGA is now seeking to procure the services of a consultant to develop and produce a new draft strategic plan for the next four years. The new strategic plan will be finalised by the ILGA Board in October 2018 and approved by the XXIX ILGA World Conference to be held in Wellington, Aotearoa/New Zealand in March 2019. Please see Terms of Reference. See also some Q&A for clarification. The project to produce ILGA’s new strategic plan should start at the end of April and a report together with a draft strategic plan should be submitted by the end of September 2018. The bid should contain a description of how the development and production of the new Strategic Plan would be carried out, a time plan, estimated number of hours required and cost per hour. Please also specify the consultant(s) to be involved and include their CVs. The deadline for submitting the bid is 15 April, 2018. 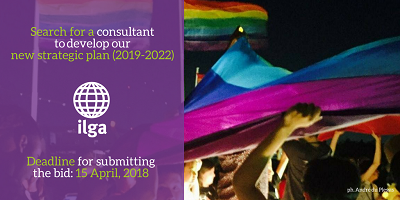 ILGA is looking for a consultant to develop our strategic plan for the next four years (2019-2022). Help us outline our priorities for the years ahead!